With the recent announcement of Justin Lin as director of the third Star Trek movie in the JJ Abrams reboot series, I’ve noticed a resurgence of dissatisfaction among some Star Trek fans with the reboot series in general. I don’t think that their complaints are particularly invalid (maybe some of their complaints) but a recent image that’s been circulating had me metaphorically shaking my head. 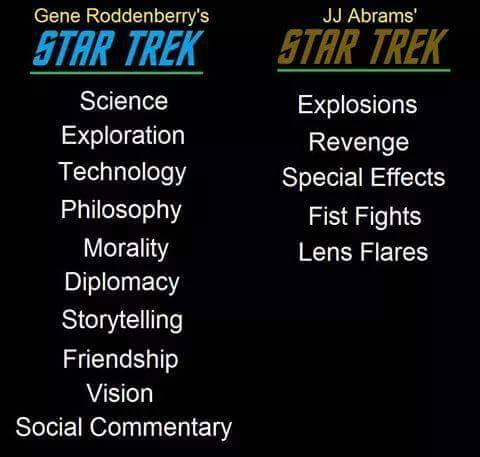 Although I appreciate the spirit behind the message, that classic Star Trek was more than just action (and lens flares) I felt that this comparison was unfair to JJ Abrams. In particular, the image (in my opinion) is cherry-picking elements from the television series (I’m confining myself to the original series Star Trek for this discussion, since Abrams’ reboot is sharing those characters) from elements in the reboot movies. Looking at the handful of classic Trek movies, most contain elements from the right-most “bad” column. There are explosions, there’s a lot of action. Certainly special effects are highlighted, like the fractal landscape-generator developed for the genesis effect in Star Trek II: The Wrath of Khan or the floating globule effects in Star Trek VI: The Undiscovered Country. Revenge? Khan quotes the Klingons on the proper temperature of revenge casserole. What’s missing in those movies are a lot of things from the left column. They’re still mostly action movies, not big idea social commentary movies or the awe of science movies. You’ll have to watch District 9 or Interstellar respectively for that. I’ll give credit where credit is due: Star Trek IV: The Voyage Home elevated itself among most of the others. It was more story-focused on the characters. I don’t remember any fistfights. There probably was a lens flare, though. 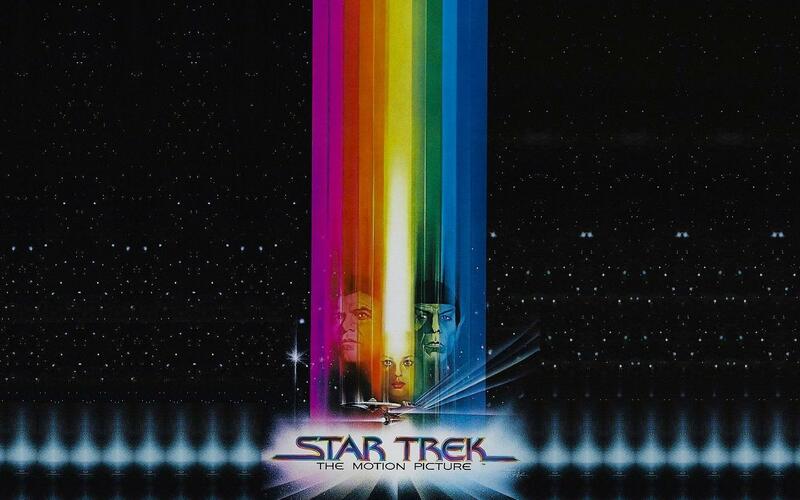 But the best example of the desired exemplar movie being described on the image’s left was Star Trek: The Motion Picture. ST:TMP was a tremendous big-idea movie and certainly reminiscent of classic Trek since the plot was very close to the episode “Changeling.” V’ger itself and the machine-based civilization that created it was an excellent example of the speculative nature of science fiction. Science! Technology! V’ger’s desire to commune with its original creator, and the interaction between humanity and the bald replicant envoy hit the philosophy marks. The resolution was brought about by negotiation, diplomacy, and exploratory self-sacrifice, and not by blowing something up. Which is why Star Trek: The Motion Picture is considered a beloved Star Trek success movie, right? Look, allies, we had a chance to get Star Trek movies that were similar in spirit and tone to the original series episodes. That chance was pretty much sunk with our reaction to the first Star Trek movie. And that’s a continuing reaction. Movie-makers are aware that cerebral, non-explosiony, non-fist-fighty movies just don’t do well. How many people saw Moon when it was in theaters? I didn’t, and I should have, because from everything I’ve heard it’s the kind of science fiction movie I tell people that I want to see. But don’t. Anyway, I’d rather be happy that we have something resembling Star Trek in theaters, with characters that are close analogues to the original cast. Hopefully, in time the franchise will feel comfortable to do stories that the original series rarely attempted, and with mixed reception. Live long and eat your vegetables, yo. I make no claims on the artwork, but some claims on the text. So there. THANK YOU!!! The new movies get so much flak. I was surprised when I enjoyed the first movie. I wasn’t expecting to, but I enjoyed it. The second one, despite Cumberbatch, I just didn’t like, but it doesn’t mean I can’t appreciate it. You’re point, though, about TV series and a big movie being different mediums is totally valid. Hey, you, thanks for the comments. I’m glad you enjoyed the first reboot, and I understand why you didn’t like the second one. I have hopes for a third one. “But the other movies were also crappy” is a defense I see now and again. Here it is again. Yes, the other movies were also crappy. Doesn’t excuse anything, and for this one simple reason: in any given cinematic year, I can point to a half-dozen or more awesome and popular films that are _closer_ to the spirit of Trek than any of the Trek films out there (Abrams or otherwise). So, it’s entirely possible to make a Trek film, it’s just that nobody ever has. Pointing to past failures to excuse current failures is the weakest of the weak sauces. And here’s a hint, for the slow students: the spirit of Trek has _always_ included action, fights, sexiness and all that shiny stuff. I don’t think I’m getting at the basis of your statements, John. It sounded like you were starting off saying that I was trying to defend the JJ Abrams reboot by claiming the original Trek movies were crappy. They weren’t, and I’m not. But your last statement sounded more like what I was saying, so I might have misread the intent of your original post. Yep, I can hear those crickets! Hey Sue. I completely respect your feelings on Into Darkness. Sometime you and I should have a chat on the one thing that would really redeem Into Darkness for me. As it was, I made a choice to enjoy the movie, but I recognize the many problems. Yes, we should. I think it was worse for me because I was massively enjoying the first half and then boom. Still a better movie than a lot of actioners I have seen. I’ll send you a long, multi-part Direct Message tweet soon about it. Because I have that power! Thanks for the comments, Molly. I know it’ll kill my friend Scot for saying this, but I do enjoy the action of the new Star Trek. “Wrath of Khan” is one of my favorite movies. That being said, I didn’t hate “into darkness.” I enjoyed the ending of it too. Can’t really explain why. I know it was kind of campy but I enjoyed it because it made me think of the original series which often made fun of itself. That being said, I did find a fight scene between Khan and Spock completely unbelievable. Too long. I felt like it was all about showing off Cumberbatch. And I don’t typically read what other people say about Star Trek movies so I’m lost on the arguments about why “they” hate the new Star Treks. I like special effects. I like explosions. I like fight scenes (when it’s good it’s like watching a dance). I guess I’m just a red-blooded American movie-goer. Thanks for the post!!!! And it was Khan + Supership! I liked that! PS – “Moon” = awesome. 🙂 I hope to make some time to see Moon some day. Thanks again for the vote. I agree with your reasoning, but this isn’t why I dislike the new movies. It’s not the explosions, lens flare, yada yada yada. For me, they cross over from Requiring a Willing Suspension of Disbelief, which is inherent to science fiction and fantasy, into Requiring a Willing Acceptance of Stoopid Stuff. I’ve tried writing a list of the Stoopid Stuff, but it gets real big and real tedious, real fast. # 1 Stoopid, to me, is that a Romulan mining vessel from the future is a deadlier and more unstoppable killing machine than either the Planet Killer from ST:TOS or the Borg Cube from ST:TNG. That’s just stoopid with at least two o’s. Maybe more. But wait, I hear you say. Wasn’t the Whale Seeking Probe from Star Trek 4 just as stoopid, and just as essential to the whole story? Um … you know, it was. You got me there. I’ll just go away for now. Yes, I very carefully didn’t judge the new movies on the merits of their plots. It’s the famous Doctor Andy everyone. If you don’t know who he is, well, that’s okay, I guess. But he’s a superhero. For the Star Trek: The Next Generation movies, Insurrection would be the one most similar to the show. There’s some action, but the big chase scene also includes Picard, Worf, and Data singing Gilbert and Sullivan. There’s the big moral questions, there’s the crew dealing with character stuff because they’re feeling young (or Geordi growing eyes). And while it’s not as hated-on as Nemesis, it’s definitely considered a lower-rung Trek movie. I didn’t hate Insurrection, but it does seem to get a lot of flak. But oh man, I really, really did not enjoy Star Trek: Nemesis. Interesting thought, putting Insurrection into a Trek: Original Series role. I think that would make a fascinating post.